Are We to Settle for "Pop Theology"? "Another prime example of our nation's willingness to embrace falsehood is the amazing popularity of the book Embraced By The Light"
On the verge of tears, actor Tom Hanks paid tribute to those homosexuals who have died of AIDS. Declaring them to be now "angels in heaven," he confidently affirmed their position of security in the arms of a loving and beneficent God. It was a moving moment at the 1994 Academy Awards, perhaps the climactic moment of the evening. The fashionable and mostly liberal audience ate it up. It was enough to make one proud to be an American. Or was it? Although few recognized it that night, Mr. Hanks, who had recently starred in the homosexual-promoting film, Philadelphia, was expressing a defined theological stance. In his short, dramatic speech, he was declaring some rather definite positions about the nature of God, the nature of sin, and life after death. He was, in effect, espousing a particular theology. Theology has received a bad rap for a number of years now. How many thousands of Christians have boldly announced, "I don't need any theology; I just want to hear about Jesus." And while that sounds pretty spiritual, the truth is that without a basic understanding of theology (the nature of God, the nature of man, the necessity for atonement, the final judgment, etc.) man is left wide open for all sorts of deception which the devil is only too happy to provide. The Scriptures make it plain that we are to grow up in the faith, and not remain spiritually ignorant. In Hebrews we are encouraged to go on to perfection, "not laying again the foundation of repentance from dead works and of faith toward God, of the doctrine of baptisms, of laying on of hands, of resurrection of the dead, and of eternal judgment" (Hebrew 6:1,2). These are some of the foundational truths that should be a part of every Christian's understanding. In the apostle Paul's writings, over and over he declares, "I would not have you ignorant." But fornication and all uncleanness or covetousness, let it not even be named among you, as is fitting for saints . . . For this you know, that no fornicator, unclean person, nor covetous man, who is an idolater, has any inheritance in the kingdom of Christ and God. Let no one deceive you with empty words, for because of these things the wrath of God comes upon the sons of disobedience. (Ephesians 5:3,5,6  emphasis added). And so we find a contradiction. According to Mr. Hanks, the homosexual, upon dying, becomes an angel in heaven. According to Paul, the homosexual who does not repent is a son of disobedience and finds the wrath of God coming upon him. From whom shall we obtain our theology, the actor or the apostle? Tom of Hollywood or Paul of Tarsus? The contrast is absurd, and would be laughable if it weren't for the fact that Americans are increasingly buying into pop theologies advanced by celebrities and ordinary folks; theologies which run directly contrary to the book we used to refer to as the Holy Bible. Another prime example of our nation's willingness to embrace falsehood is the amazing popularity of the book Embraced By The Light. This account of a Seattle homemaker's near death experience was 42 weeks on the New York Times best-seller list with hardcover sales well over one million and no letup in sight. The phenomenon has turned the author, Betty Eadie, into a national celebrity. "I cried all the way through it the first time," said one lady in Dallas. She added: "I bought 10 copies for people, and I told them, when you don't have anybody to pass it on to, give it back to me. They're still out there." The book has a distinctive Christian flavor to it. Listen to part of the dedication: "To The Light, my Lord and Savior Jesus Christ, to whom I owe all that I have. He is the 'staff' that I lean on; without him I would fall." You can't sound much more evangelical than that! Yet, when you get into the book, you find an amazing conglomeration of heretical teaching, occult and mystical philosophy, and pseudo-psychological babble, all mingled with a Christian frame of reference. Jesus is spoken of highly, though it is firmly insisted upon that it is not necessary to put our trust in Him in this life: "Whether we learn of Jesus Christ here or while in the spirit, we must eventually accept him and surrender to his love." Ms. Eadie tells that while she had this death experience, she found three friends, dressed like monks. They told her that they had been with her for "eternities," and they had many things they wanted to share with her. And so they gave her a crash course in metaphysical theology. During this course she learned that "all religions upon the earth are necessary because there are people who need what they teach. People in one religion may not have a complete understanding of the Lord's gospel and never will have while in that religion. But that religion is used as a stepping stone to further knowledge . . . There is a fullness of the gospel, but most people will not attain it here." In other words, if you have a friend that is a Buddhist, relax. He may not receive Christ before he dies, but he's being helped by his Buddhist beliefs, and he'll have ample opportunity to come to believe in Christ in the next life. This "theology" is radically different from that taught by the Lord Jesus Himself. He declared, "I am the way, the truth, and the life. No man comes to the Father, except by Me" (John 14:6). And in another place He insisted, "If you believe not that I am He, you will die in your sins" (John 8:24). Once again we have a contradiction and a choice to be made. Shall we accept the words of Jesus Christ or Betty Eadie? Shall we accept the statements of the One who raised the dead, healed the lepers, cast out demons, and lived a sinless life, or shall we put our faith in a Seattle homemaker who learned her theology from three "monks" who had known her for "eternities"? Another example of homemade theology is the ever-growing movement which encourages Christians to practice self-love. For nearly two thousand years, theologians have studied the Scriptures intensely and never found the slightest hint that we must love ourselves. The apostle Paul, in his letter to Timothy, wrote that in the corrupt society of the last days, men would be "lovers of themselves" (2 Timothy 3:1,2). According to Paul, self-love is a sign of apostasy, not good psychology. A person is in hell when he has lost his self-esteem. The core of original sin is lack of trust. Or it could be considered an innate inability to adequately value ourselves. When Jesus tells us to pray "Deliver us from evil" what we really need is to be delivered from a negative self-image. The Lord has often reminded me what a poor creature I am in myself, incapable of standing a single hour without continual fresh supplies of strength and grace from the fountain-head. It seems that the author of Amazing Grace had a radically different view of God and man than does televangelist Robert Schuller. According to Mr. Schuller, no longer are we to be saved from sin, no longer shall we sing about an amazing grace "that saved a wretch like me." Instead, our great need now is to be saved from a negative self-image, in order that we may properly appreciate and love ourselves! These are but a few examples of the errors and heresies that abound in the world today. These falsehoods are able to survive and thrive because America, as a whole, has thrown theology to the wind and become a nation of Biblical illiterates. In past generations, theological study and sound biblical expository preaching were looked upon as a very good thing. Children were taught Christian doctrine from a very young age. Men like Jonathan Edwards and Andrew Murray wrote books which touched the heart and educated the soul. They wrote from a heart inflamed with love for Christ, and with a depth of understanding that revealed that these were men who had spent innumerable hours in the word of God. May God give us such men today! Theology can be dull and dry, or it can be alive and powerful. The key is Jesus Christ. When He is central, and all truth is related to Him, theology can be exciting, and will prove to be a powerful protection against all forms of deception. Let us be good students of the word, feeding on its truths, applying its precepts, and worshipping the Savior of whom the Scriptures so faithfully testify. Dennis is an avid student of the Scriptures, Dennis has given intensive study to the theme of revival and spiritual awakening (both in the Bible and in the history of the church). He has also developed in-depth teachings on the theme of grace vs. legalism and on the topic of the person and offices of the Lord Jesus Christ. Dennis is also prophetically gifted in applying the truths of Scripture to the current issues of our day. Dennis and his wife, Sharon, have five children. They have a strong commitment to the family values of God's Word, and Dennis feels a special burden to teach parents how to raise up children for the glory of God, fully equipped for every good work. Dr. Reagan first became acquainted with Dennis through a preaching tape that was sent to him by a radio listener who was a member of the church that Dennis pastored. Dave was so impressed with the power of Dennis' preaching that he immediately subscribed to receive his monthly tapes and publications. Over the next two years Dave was spiritually nourished by Dennis' profound insights into God's Word. You can imagine how startled Dave was when Dennis suddenly wrote to him in 1993 and said he felt like the Lord had spoken to him in a dream, directing him to contact Dave about a position with Lamb & Lion Ministry. Dave had been praying for the Lord to provide him with an associate, so he took Dennis inquiry as being truly from the Lord. 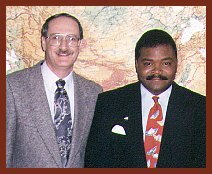 After interviewing Dennis in depth, the trustees of the Ministry agreed, and Dennis was called to serve the Ministry as its Associate Evangelist in the summer of 1993. Since that time, Dennis has established himself as a skillful writer, an insightful teacher, and a powerful preacher.